An emotionally charged hearing over a proposal to require background checks on private gun sales and transfers marked the first pitched partisan battle of the 2019 legislative session, with lawmakers split on whether the bill would carry out the will of the voters or create barriers to legal gun ownership. During more than 90 minutes of at-times heated questioning in a crowded committee room, lawmakers parsed the intricacies of a gun background check bill introduced by Democrats on Monday, including whether the bill’s definition of transfer applies to someone living in a house with a roommate’s unsecured gun to how police would go about enforcing the law. The debate preceded hours of impassioned testimony from supporters and opponents alike, including Democratic Gov. Steve Sisolak, who told lawmakers that he would be proud to sign the bill. The measure, which only needs a simple majority of votes to pass, is all but certain to land on Sisolak’s desk given safe Democratic majorities in the Assembly and Senate. Democratic leaders have signaled their desire to time votes on the bill with the Feb. 14 anniversary of last year’s mass shooting at a high school in Parkland, Florida. 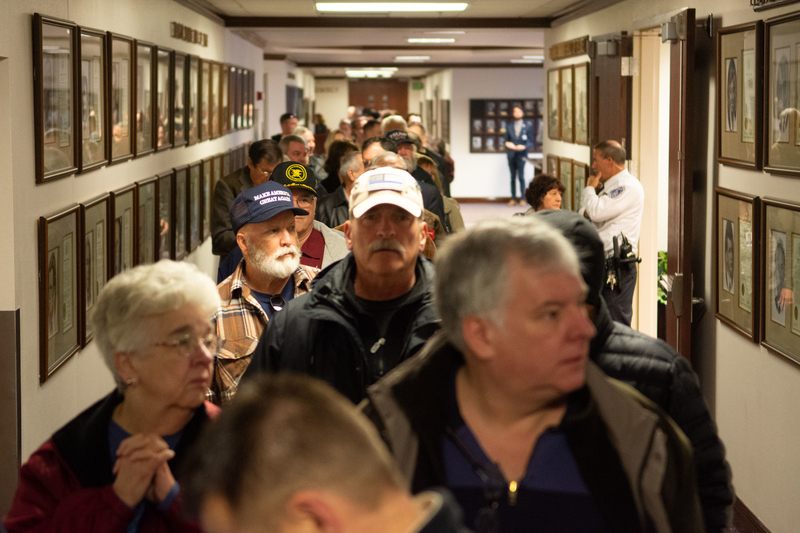 The measure was heard by a joint meeting of the Senate and Assembly Judiciary committees on Tuesday, with senators voting out the bill on a party-line vote late Tuesday afternoon. The bill is likely to come up for a full Senate vote on Wednesday, and Assembly Speaker Jason Frierson said in a brief interview that the Assembly will not suspend any rules and proceed normally on the bills; which takes a minimum of three days. At a press conference on Tuesday afternoon, Sisolak told reporters that he “certainly hoped” that the bill would be signed this week and hinted that issues identified by Republicans would likely not stop him from signing the bill. Democratic Senate Majority Leader Kelvin Atkinson, who sponsored the bill and presented the legislation during the hearing, repeatedly emphasized that the measure was nearly identical to an initiative approved by voters in 2016 apart from a change requiring the state and not the FBI to conduct the background checks. He highlighted a Las Vegas woman who police said was killed by her ex-boyfriend after he lied about his criminal history and purchased a gun from a private seller in 2016 without going through a background check. Atkinson said his daughter had gone to the same day-care center where the woman was shot. But legislative Republicans argued that the change requiring the state to provide the background checks makes it substantively different than the voter-approved measure and identified a slew of additional concerns with the legislation, charging that its definitions were too vague and could result in absurd limits on transferring guns between in-laws or while hunting. 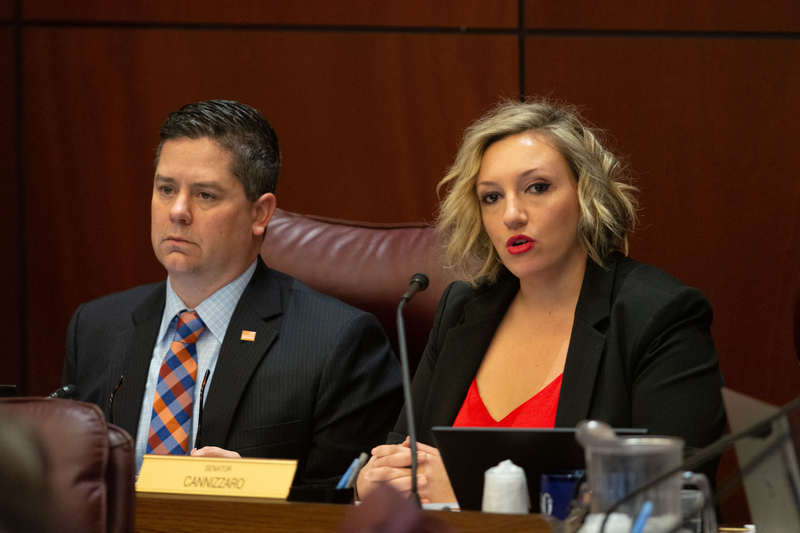 “This is not the same question that was actually on the ballot and was defeated in the bulk of the state of Nevada, with the exception of Clark County,” Sen. Ira Hansen said. The legislation is the latest in a seven-year push from gun control advocates to apply “universal” background checks on private party gun sales and transfers, with exceptions for direct family members, law enforcement, antique firearms and while hunting or trapping. A similar bill proposed by former state Sen. Justin Jones was vetoed by Republican Gov. Brian Sandoval in 2013; the measure then qualified for the 2016 ballot and was narrowly approved by a 0.9 percentage point margin but has languished as the FBI has refused to conduct the checks. Several Republicans chafed at the suggestion from the attorney for the national gun-safety group Everytown For Gun Safety, who provided most of the technical testimony on the bill, that there might be ways to circumvent the familial transfer provisions of the law. The attorney, William Rosen, told Assemblywoman Jill Tolles that while her sister-in-law could not directly transfer her a gun, she could give it to her husband who then could legally transfer it to Tolles as his spouse. Though proponents pointed to studies showing that background check laws reduce gun violence deaths, Republicans argued that the legislation wouldn’t do anything to actually prevent crime. “Laws like this, frankly, only apply to people who are law-abiding,” Hansen said. 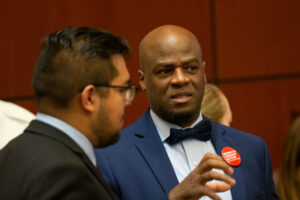 A slew of prominent Democrats and progressive groups appeared to testify in support of the bill, including Attorney General Aaron Ford, Assembly Speaker Jason Frierson, Sen. Yvanna Cancela and a lobbyist for Clark County District Attorney Steve Wolfson. Assemblywoman Sandra Jauregui, who survived the Route 91 Harvest Festival on Oct. 1, 2017, acknowledged in testimony that the pending legislation would not have prevented the 58 deaths that night. But she said that she was testifying in solidarity with survivors of gun violence. Others also shared personal experiences. At a press conference supporting the bill, Clark County School District Trustee Linda Cavazos said her younger brother, Louie, committed suicide at the age of 26 and suggested that a background check could have prevented the shooting. 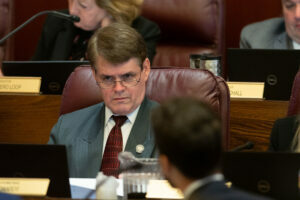 During the hearing, Republican Assemblyman Chris Edwards raised concerns that active duty military and reserve members who own firearms could quickly run into problems if they are deployed and forced to leave their weapons with a roommate or fiance, which could run afoul of the law’s prohibition on transferring firearms without a background check. In testimony, opponents argued that the legislation wouldn’t reduce crime, said that it would limit gun access due to the costs associated with dealers running gun background checks and expressed concern that it would lead to the registration or eventual confiscation of guns. 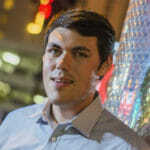 Dan Reid, a lobbyist for the National Rifle Association, said the bill would unequally treat concealed carry weapon permit holders — who aren’t required to get a background check if they purchase a firearm from a licensed dealer as long as their permit was issued after 2011 — by requiring them to undergo background checks for any private sales or transfers regardless of status. 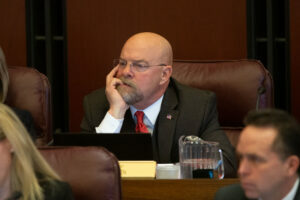 Storey County Sheriff Gerald Antinoro told lawmakers that their efforts would be better suited to addressing mental health funding and other issues and suggested that recent mass shootings wouldn’t have been stopped even with “universal” checks in place. “Why don’t we look at the real problems and not just do something knee-jerk that’s going to have little effect?” he said. Initial opposition testimony was cut short with scheduled Senate and Assembly floor sessions, but NRA lobbyist Dan Reid, retired Las Vegas Judge Donald Mosley, Lyon County Commissioner Ken Gray and Storey County Sheriff Gerald Antinoro testified against the measure. Lawmakers were slated to continue the hearing at noon. A fiscal note submitted by the Department of Public Safety on Tuesday said the bill would have “no fiscal impact” to the state as long as the volume of voluntary private party background checks stays consistent. It noted that voluntary checks performed by the department for private-party sales or transfers totaled only 215 since December 2017, or about 0.2 percent of all background checks processed by the department over that time. But it’s unclear whether the cost and number of background checks will remain static. A 2016 fiscal analysis of the ballot initiative estimated that it would cost around $650,000 per year to process the expected increased number of background checks. Updated 2-12-19 at 2:08 p.m. to include additional comments from supporters and opponents of the legislation, as well as Gov. Steve Sisolak and Attorney General Aaron Ford. Updated again at 5:33 p.m. to reflect that the bill has passed out of committee.